Some of the world’s best athletes and brightest celebrities met on the crowded red carpet in front of the Microsoft Theater in Los Angeles before the 25th annual ESPY Awards Wednesday. Despite the sweltering July heat, pros from the NBA, NFL, NHL and MLB looked cool and relaxed as they paraded into the hall to celebrate their achievements in sports — and popular culture. Future Hall of Famer Peyton Manning has been nominated for an ESPY Award 19 times over the course of his pro career — he’s won nine times. This year, he hosted the show and threw plenty of zingers. While the highlight of the night was undoubtedly the appearance of Michelle Obama, who presented the Arthur Ashe Courage Award posthumously to Eunice Kennedy Shriver for her role in creating the Special Olympics. Golden State Warriors superstar and two-time NBA champion Stephen Curry looked perfect in a black-on-black tux. Curry’s wife — and best-selling cookbook author — Ayesha Curry, brought some disco-era cool to the yard with her granite-colored, sequined jumpsuit. NBA player Stephen Curry (right) and Ayesha Curry attend The 2017 ESPYS at Microsoft Theater on July 12 in Los Angeles. Seattle Seahawks quarterback Russell Wilson walked the red carpet in a black velvet Tom Ford tux jacket and pants. Wilson attended without his wife Ciara, who gave birth in April to the couple’s first daughter, Sienna. NFL player Russell Wilson attends The 2017 ESPYS at Microsoft Theater on July 12 in Los Angeles. 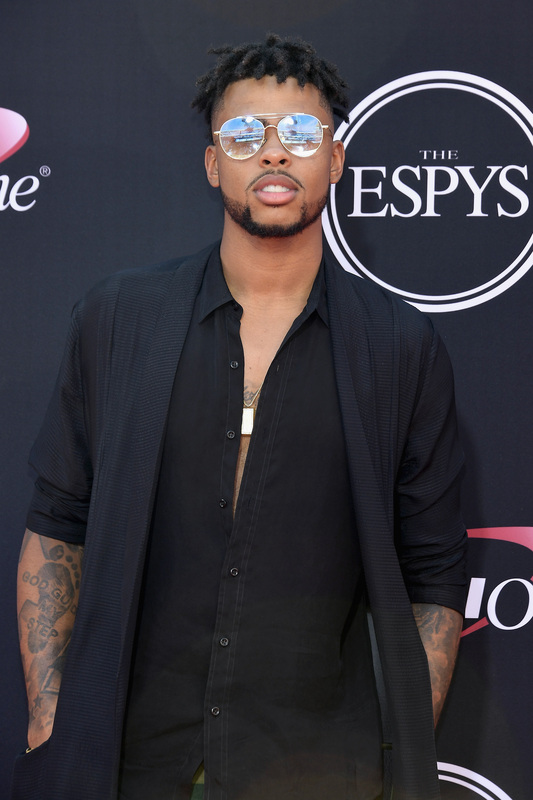 NBA player D’Angelo Russell attends The 2017 ESPYS at Microsoft Theater on July 12, 2017 in Los Angeles, California. Former Los Angeles Laker and current Brooklyn Nets point guard D’Angelo Russell followed in the (camouflage pants) footsteps of another fashionable Russell (Westbrook). The 2017 league MVP brought his best green pants — and gold chains — to The ESPYS. NBA player Russell Westbrook (right) and Nina Earl attend The 2017 ESPYS at Microsoft Theater on July 12 in Los Angeles. Courage and perseverance were the themes of the show, and no one represented those two things like 15-year-old Saints superfan Jarrius Robertson, who received the Jimmy V Perseverance Award for his battle with a rare liver disease. Robertson’s tiny black-and-gold tuxedo repped for his hometown of New Orleans. 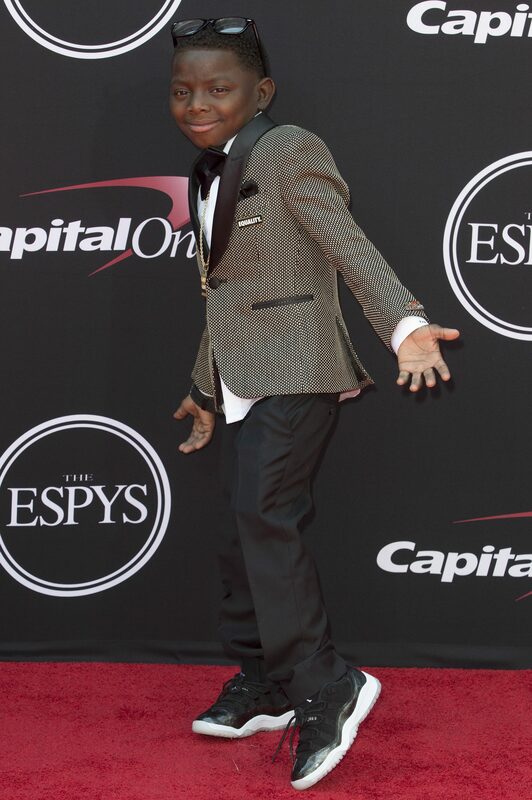 Jarrius Robertson attends The 2017 ESPYS at Microsoft Theater on July 12, 2017 in Los Angeles, California. U.S. Olympic gold medal winner Simone Biles was nominated this year for Best Female Athlete. Her blue dress and towering sandals were a perfect combination. Simone Biles on the ESPYS red carpet. 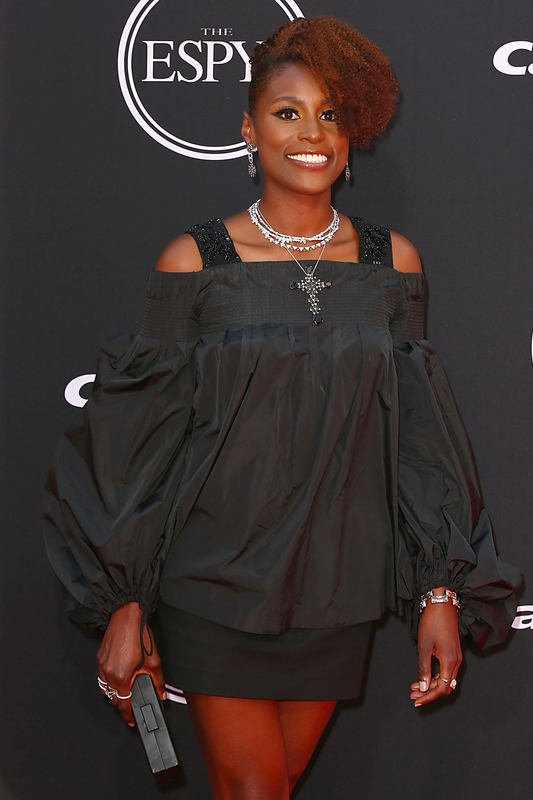 Issa Rae, creator and star of HBO’s hit Insecure, looked quite secure in a black miniskirt and billowy top. Issa Rae arrives at the 2017 ESPYS at Microsoft Theater on July 12, 2017 in Los Angeles, California. And you’ve gotta love a guy who switches out formal neckwear for chest tattoos and chains. Los Angeles Clippers star DeAndre Jordan did L.A. cool in a camel tux and gray suede shoes. 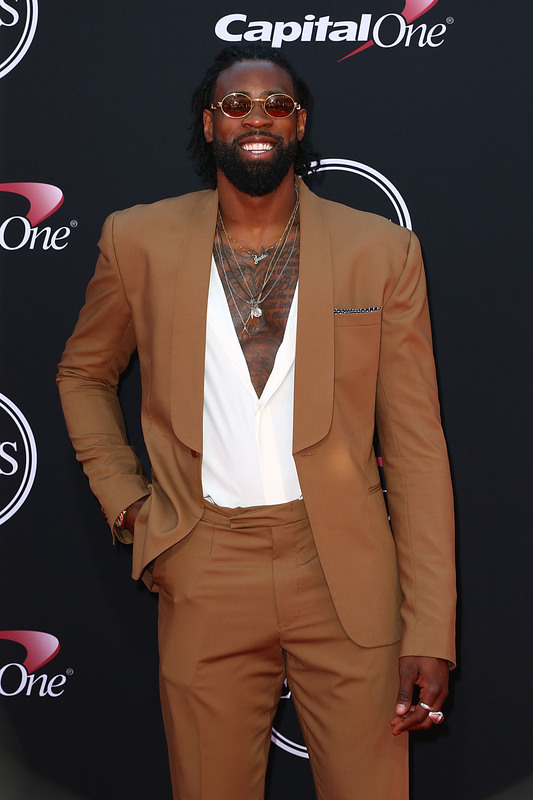 DeAndre Jordan arrives at the 2017 ESPYS at Microsoft Theater on July 12, 2017 in Los Angeles, California. Nashville Predators defenseman P.K. Subban has become de facto ambassador for Music City, and for hockey itself — and his robin’s egg-blue jacquard jacket and vest added a little Southern charm to his ensemble. NHL player P.K. Subban attends The 2017 ESPYS at Microsoft Theater on July 12 in Los Angeles. The award for Best Breakthrough Athlete went to Dallas Cowboys QB Dak Prescott, who came through in a beautifully tailored gray tuxedo jacket and black pants. NFL player Dak Prescott attends The 2017 ESPYS at Microsoft Theater on July 12 in Los Angeles. One of the best dressed men of the night: Memphis Grizzlies guard Mike Conley, Jr., who wore a silk tux with a black-and-gray circular pattern.